Last Tuesdayâ€™s National Executive Committee meeting of the All Progressives Congress (APC) came as a climax to months of expectations and uneasy calm within the ranks of the ruling party. Before the meeting, the party had come under stringent criticism for failing to hold regular statutory meetings to the extent of even running foul of its own constitution. This is in addition to further coming under attacks from some of its stakeholders, who felt aggrieved by certain actions and inactions of the party in the past two years. A combination of factors, including the ill-health of President Muhammadu Buhari, which kept him out of the country for some time made it almost impossible for the party to hold its National Executive Committee meeting until last week. After assuming power at the centre, the party appeared to have run into trouble, which made it lose grip of most its key men in government. What looked like an imaginary wall existed between the party leadership and the President Muhammadu Buhari administration to the extent that it National Chairman, Chief John Odigie-Oyegun, hardly find easy access to the President. The party got alienated from the Buhari-led administration to the extent that it was no longer consulted, when certain categories of appointments were made. The result was that most party men, who relied on the leadership of the party to get appointments as a reward having made sacrifices during the election became stranded as none was forthcoming. Rather than the party doing the recommendation, it was alleged that certain cabal around the presidency had taken over and got their friends and cronies into juicy positions. On many occasions, the state chairmen of the APC protested their irrelevance in the scheme of things as far as selection for federal appointments were concerned. They mounted pressures on the Oyegun-led National Working Committee and accused them of not doing enough to protect their interest. Again, when the interests of political gladiators in the party clashed, the party further found itself in a messy situation. Before last weekâ€™s meeting, the situation in the party had become very tense. Notable leaders of the ruling party like Tinubu and former Vice-President Atiku Abubakar had become almost estranged with the party. 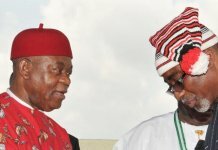 While Tinubu was known to have openly mouthed his disdain for the present party leadership, over its handling of the governorship primary in Ondo State, Atiku Abubakar complained bitterly that he was not being carried along both by the party and the administration. The former Vice President may have expected to play a role through the Board of Trustees (BoT) but for some unknown reasons, that important party organ had remained a still-birth. The result of all these was that the party found itself in a precarious state, almost finding it very difficult to discharge its routine obligations of funding its operations. At a stage, it became a major challenge how to mobilise funds to prosecute its non-elective convention. In fact, speculations were rife that a certain group of governors were plotting to use the NEC meeting to seek the resignation of Chief Oyegun and other members of the NWC perceived to be part of the problems of the party. Perhaps, sensing the charged atmosphere, President Buhari decided to first hold consultation with the national leader, Tinubu before the wider meeting of the national caucus of APC. The meeting with Tinubu as well as other informal discussions the president was said to have had with other aggrieved stakeholders apparently did the magic and helped to calm nerves. The national caucus of the party meeting held at the Presidential Villa in Abuja further doused the tension before the NEC meeting. Some the governors elected on the platform of the party, who bared their minds on the outcome all shared optimism that APC was on its way back to form. The Governor of Nassarawa State, Tanko Almakura, told journalists shortly before the NEC meeting began that the tone had been set at the caucus meeting. â€œAt this meeting, we could see a family meeting, a family reunion, a meeting of committed people for a cause, a meeting where all the stakeholders that matter in the party were present and everybody expressed his or her view in line with our vision, without commitment and with our intention to take this country to the next level,â€ he said. For Governor Atiku Bagudu of Kebbi State, the president has once again convinced the party leaders of his sincerity of purpose in the handling of the affairs of the country. 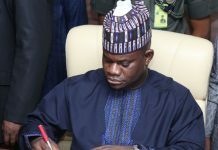 In giving his own account of the caucus meeting, Governor of Plateau State, Simon Lalong, said notwithstanding the tense moments that griped the party to the extent that people thought it will be the end, APC survived it. â€œThe meeting was very brief and as brothers, we resolved on many issues that mostly centred on encouragement for him to give Nigerians good governance and carrying the party along. What will be the biggest take-away is to roll out a brand new APC devoid of wrangling. I want to assure you that you wonâ€™t see a wrangling party after the meeting. From now onwards, it will be focused governance from Mr. President and all the governors from the states. We have all resolved to support Mr Presidentâ€. On his part, the chairman of the APC Governors Forum and the governor of Imo State, Rochas Okorocha, described the meeting as very critical. He said the President is showing the right leadership and taking the very right steps and that there is reconciliation going on even with nobody talking about it. â€œThis is perhaps one of the most vital NEC meetings that will tell the whole world as to the strength of this party. From the caucus meeting of last night, we can see light at the end of the dark tunnel. APC is coming out of the woods and we are set to take over the nation like we have always done. It is going to get better and better,â€ he said. However, one issue that was agitating the minds of the party men and indeed Nigerians was that of whether President Buhari would contest in the 2019 presidential election and if APC would give him an automatic ticket. It is also one issue that seems to have the capacity to make or mar the party. Some of the governors, who were bold to share their opinions evaded the issue of automatic ticket but offered their personal opinion on the candidacy of President Buhari. For example, Lalong said all the APC governors have resolved that they would work for his return ticket. â€œI want to say that if Mr. President is performing, is well respected and carrying everybody along â€“ all of us have resolved that we will work for him. Do we have any other person that will challenge the President again? Whatever you call it, as far as we are concerned, we have one President and that is the ticket we will flyâ€. Echoing Lalongâ€™s position, Bagudu said he would give the president his support based on his sterling performance. â€œI think for APC members, it is a democratic party, number one. But the performance of the President in the last two and a half years suggests that if he wants to contest, I will certainly support him and I know that our party members feel the same about himâ€. Alâ€™makura reiterated that the greatest asset Buhari has is his acclaimed integrity and impeccable character, and the fact that he has endeared himself to Nigerians. However, Almakura said that any consensus arrangement that did not follow democratic process is not what President Buhari needs. The outcome of the NEC succeeded in putting paid to the rancour in the party at least, momentarily. The NEC members thus unanimously gave a vote of confidence to President Buhari for satisfactory performance, while the national chairman also got a vote of confidence in what was seen as a new spirit of reconciliation and unity. Addressing journalists at the end of the NEC meeting, the Speaker of the House of Representatives, Rt. Hon. Yakubu Dogara said the party reviewed its activities in the past year and also took decisions on how to reshape its future. Dogara let out what the party would have loved to conceal when he spoke of how another motion was raised by a member urging for a vote on automatic ticket for the President but was shut down. Dogara said: â€œEven though there was a motion from the floor that called for a vote of confidence on the President, some of us felt it was not necessary because there is nowhere that his confidence is shaking. But the motion was taken and passed. But, there was a second leg to that motion which calls for the adoption of the candidature of the President, but it was differed for now and no decision was taken because that is not the major reason we are hereâ€. However, addressing the NEC meeting, President Buhari said his administration would expand the federal cabinet to bring in more supporters of the party. Apparently responding to agitations by his party men, who complained of being shortchanged in appointments, President Buhari told the meeting that apart from rejigging the cabinet, the government will also do something about all outstanding board appointments. 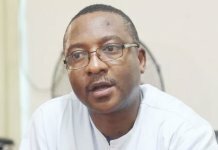 The president, who said he was proud of his administrationâ€™s achievements in the last two years, in the areas of tackling Boko Haram, Niger Delta security crisis and ensuring regular fuel, improved power, TSA, agriculture and fertilizer, also maintained that corruption would not be tolerated by the government as a clear sign that there is change. â€œOn the other hand, I am keenly aware that our supporters are very eager for these appointments to be announced. By the Grace of God, these appointments will be announced sooner, especially now that the economy is improving, we will have the resources to cater to the appointees. By the same token the compressed Federal Executive Council will be expanded to bring in more supporters at the federal level, with fresh ideas to be injected into the government,â€ he said. Although the final outcome of the APC NEC meeting failed to confirm some of the fears in the party, the issue of second term for President Buhari and whether to grant him automatic ticket were left hanging in the balance. From all indications, the unresolved issues of the presidentâ€™s second term bid and that of automatic ticket is one dicey matter that will continue to haunt the leadership of the party. Meanwhile, the Oyegun-led National Working Committee of the APC presented what seemed like its scorecard to the NEC meeting. The party claimed in the report that its support base and fortunes with the electorate had continued to grow across the country despite the economic challenges in the polity. As a testimony to the popularity of the APC, the National Organising Secretary, Senator Osita Izunaso, who presented the report, listed the major victories recorded by the party in the past one year to include its triumph in the Edo and Ondo States governorship elections. The party also said as a result of various bye-elections, court-ordered re-run polls as well as defections, it has been able to increase the number of its members in the National Assembly. For instance, the party said its majority in the Senate has increased from 59 to 70 out of the 109 senators. 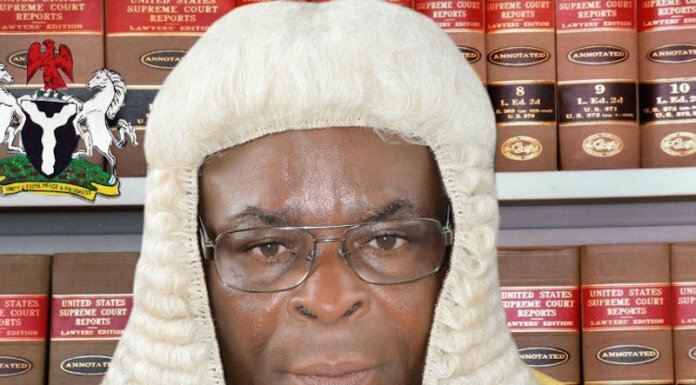 According to the report, the affected senators include Senator Ovie Omo Agege (Delta), Senator Andy Uba (Anambra), Senator Nelson Effiong (Akwa Ibom), Senator John Owan Enoh (Cross River), Senator Joshua Dariye (Plateau) and Senator Yele Omogoruwa (Ondo). In the same breath, it claimed to have gained more members in the House of Representatives from a gale of defections that hit other parties. At present, the party said it has a total of 220 members out of the 360 federal lawmakers. And to further reassure stakeholders that the ruling party was still the place to be, the report of the NWC listed some political gladiators that recently joined its fold. These are a former Senate President, Ken Nnamani, former governors Jim Nwobodo, Orji Uzor Kalu, Sullivian Chime, Martins Elechi, Alhaji Mahmud Shinkafi, Alhaji Garba Umar, Col. Musa Muhommed, Senator Florence Ita Giwa, Dr. Aliyu Modibbo, Senator Abdullahi Idris and Cairo Ojougboh. Next articleSo, Whatâ€™s the Deal?